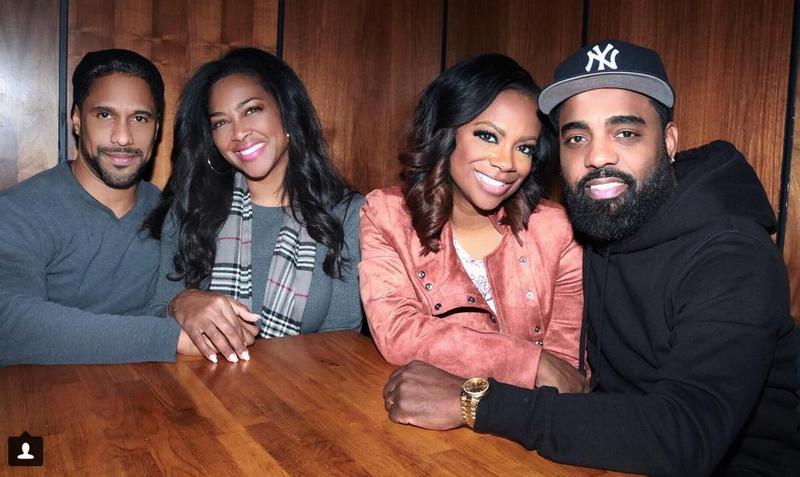 Atlanta housewives Kandi Burruss and Kenya Moore are having big fun in the big city. On Thursday night the Real Housewives of Atlanta stars were all sharing the love in New York City. Burruss and her husband, producer Todd Tucker, enjoyed a double date with Moore and her new husband, Marc Daly. Both couples met up to dine at Daly’s trendy NYC eatery SoCo in Brooklyn then shared a sweet photo from their evening together. Burruss is in town through March for her big Broadway debut. She’s starring in Chicago for an eight-week run, which began at the top of the year. The Xscape singer plays Matron “Mama” Morton. Burruss and Tucker, who own their own restaurant in Atlanta called Old Lady Gang, gave the meal rave reviews. “The food at his restaurant @socobk was awesome!! !” said Burruss when she shared their group shot on Instagram. It’s nice to see the Housewives enjoying drama-free time together off-screen.